The best way to have two generators is to actually install two generators. But two generators would be a tight fit in our engine room. 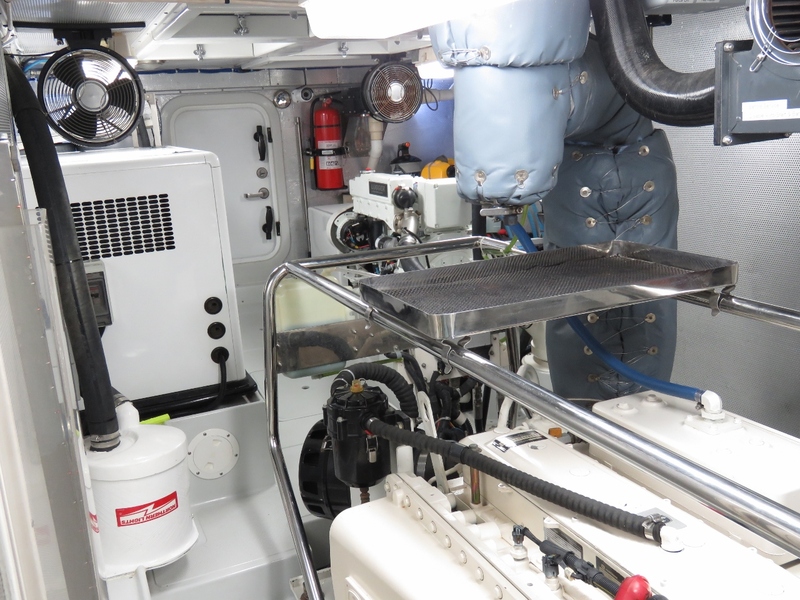 Milt Baker proved on Nordhavn 4732 Bluewater that, with skill and forward thinking, you actually can fit two generators into a Nordhavn 47 or 52. It is a rare configuration. 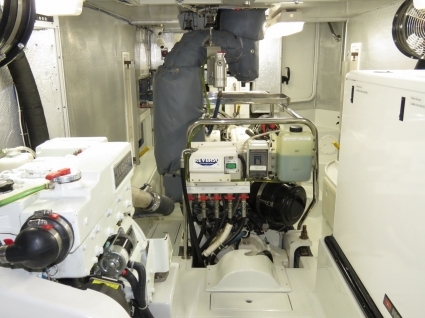 Most, if not all, Nordhavn 52 owners just end up electing to install a single generator. In our case, I’m close to Milt in my love for redundancy and back-up systems, but I ended up concluding that it was just too tight to add a second generator to Dirona. Two generators would be a tight fit in our engine room. In retrospect, I regret not finding a way to have a second generator. Given that our generator has 5,248 hours and has never failed to charge the batteries when needed, it’s easy to say “don’t worry about it” but we often leave our boat for an hour and then end up meeting with someone or finding something interesting and not actually returning for 14+ hours. Sometimes we’re off the boat for multiple days and power isn’t available. Rarely, but not close to as rarely as we like, dock power ends up failing while we are away from the boat due to someone plugging into too much load, a dock fault, or some other issue. 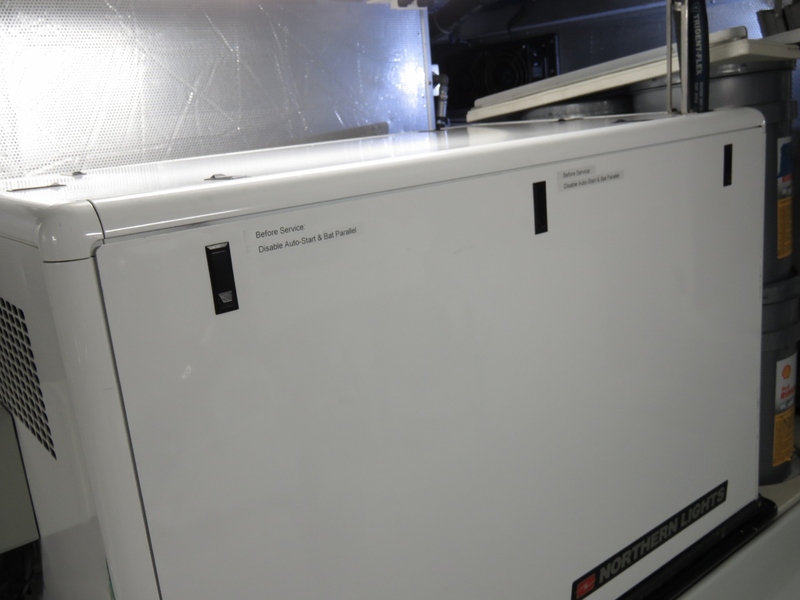 In all these cases, when the batteries get down to near 55% charge, our generator auto-starts, warms up to 150F, charges the batteries to just over 80%, disconnects the load and cools down for 60 seconds before shutting down. This is implemented through a combination of a Northern Lights Wavenet controller and custom automation software that we have written. The upside of this system is our batteries are never taken through a damaging deep discharge cycle. It’s super hard to stay on top of charging and never let the batteries get too low without some automation. You either have to run the generator every time you go anywhere on the risk you may be gone longer than you originally thought, or you are just about assured of seeing some deep discharges over the life of the batteries. If you travel away from the boat as we do and don’t have auto-start, there will be some faults or accidents that will lead to damaging deep discharge cycles. Just as many home owners leave their furnace on a low setting when away from the house to prevent pipes from freezing, we do the same with the generator. It’s always ready to go, starts when needed, does its work and then shuts down. We just let it run when needed and end up never thinking about it. It comes on during the night if needed and it doesn’t if not needed. It comes on if we are gone too long but otherwise doesn’t. It’s great to just not have to think about it. Since we have never had a generator availability problem, you could argue the system we have is sufficient, but I worry that there will come a time when the generator doesn’t start. Someday a starter will fail or perhaps a breaker will trip. It’s been perfect but someday it’ll fault. 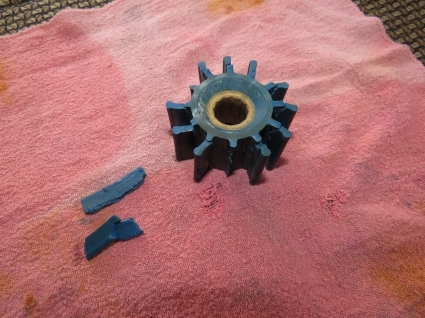 One fault we have seen 5 or 8 times over the life of the generator is a cooling system impeller failure. When this happens, the generator temperature goes up quickly but the auto-start system detects this and just shuts the generator down without hurting the equipment or putting anything at risk. I can change an impeller in 30 or 40 minutes so it’s just not a big deal. But what if we aren’t on the boat? Impeller failures are so rare that we’ve never had one while away from the boat. But they do happen, even if you change them regularly so I’ve recently started to think about backup options. A few months back, Jennifer caught me measuring the lazarette trying to find space for a small generator. It’s really challenging when you have had a boat for eight years and then go looking for space to install an entire new generator. And the worst thing is I kind of like having one small generator that we work hard. We would only rarely use the second generator. I hate the idea of installing a second generator when we actually might never really need it. In fact, if you assume you only have two or three of these rare failures in the life of the boat, it might be cheaper just to let the batteries take the deep discharge. Perhaps the abuse will cost a $6000 set of batteries but, as bad as that feels, it’s still cheaper than a second generator and finding the space for a second one would be difficult. I’m not good at saying “there’s no perfect” solution and giving up. But, in this case, it really is clear there is no perfect solution. However, we did find a compromise we like: use the main engine as a second, rarely-used “generator.” Our main engine has 9kW of alternators and actually can produce more power than the second generator on many small to medium sized boats. We have sufficient inverter capacity to run anything on the boat including the air conditioning and even the SCUBA compressor. So between the 9kW of main engine alternator and the 120V and 240V inverters, we have a complete secondary power generation system. Our primary generator is 12kW, so a backup of 9kW is more than we need. Since this purely is a backup generator application, the biggest risk we run is the backup generator needs to be tested frequently and regularly serviced. Using the main engine has the advantage that it is well-maintained, used constantly, and always ready to go. Using it as a backup generator has the disadvantage of winding up hours on the main while it runs at silly light loads but, when you think about it, this is a backup application that should only rarely happen. 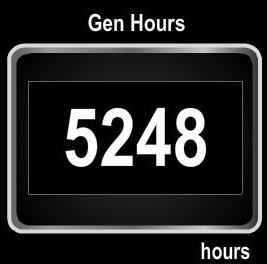 A couple of hours at light load in the main engine’s 9,545 hours is basically immaterial. It’s not the most efficient way to produce power but, again, it’s a backup application that will be rarely used, so efficiency really isn’t the focus. We are just trying to take care of our batteries until the generator can be serviced and take over its primary power generation issues. I really like the idea of using the main engine as a back-up generator. It requires no additional space and has very little incremental cost. But there are some issues that need to be solved. If we are on the boat, we can just fix the generator and get it back running, or we can start the main engine in the never-happened-yet event where the generator goes down and can’t be brought back up before the batteries need charging. The issue that is hard to solve is what to do if the generator fails to start or an impeller fails when we are not on the boat? We use an auto-start system to start and stop the generator, and wanted to add the same thing to the main. Reviewing what we had prior to this project, the generator auto-start system will start the generator whenever the batteries get down to near 55%, it will warm it up to 150F, add the load, charge the batteries, disconnect the load to allow a cool down cycle, and then the generator is shut down. What I wanted is exactly the same thing for the main engine. Auto-start systems essentially require 2 major components: 1) an engine controller to handle starting, stopping, and safety shutdowns on low oil pressure, high temperature, etc., and 2) a sense system that can track battery state of charge and signal “start” when needed. 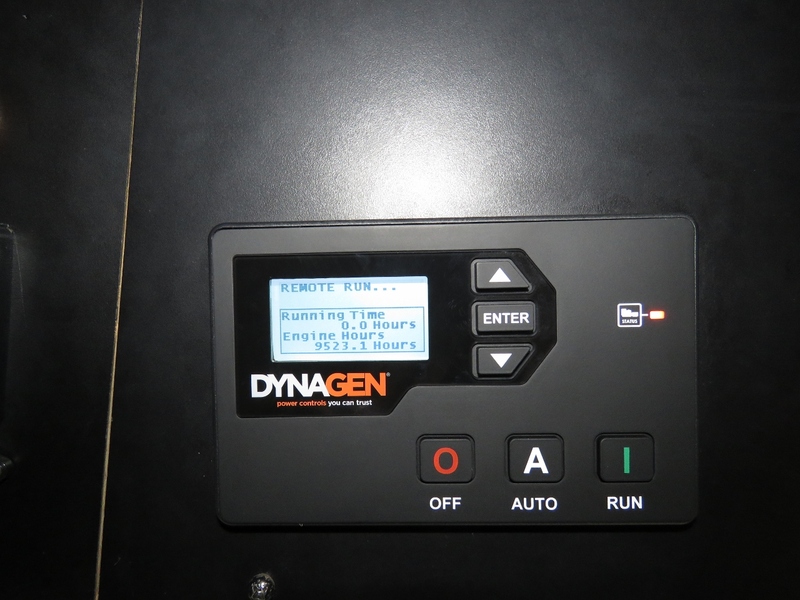 Looking fist at the first component, the engine controller, I surveyed the market and ended up deciding to go with a Dynagen TG410. Partly I chose Dynagen since Northern Lights uses them and Northern Lights is an unusually safety-focused company. I use a Northern Lights Wavenet on both the Generator and the Wing engine on Dirona and really like what Northern Lights has done with them. I find Wavenet simple to understand, easy to use, and reliable. But Northern Lights did all the work of making these controllers easy for their customers. On the main engine, I would need to find my own solution and do my own application engineering. I like the Dynagen equipment, they responded quickly and in detail when I sent them email asking questions, and it sounded like the TG410 was both good value and plenty capable for this application. Installing an engine controller to a modern electronically-controlled diesel engine is actually much easier than adding one to an older mechanical engine. I plugged in the J1939 connection and configured the Dynagen to use J1939 and, on this work alone, the engine controller was able to send engine “on” and “start” signals, although neither are yet enabled. This single connection gives the engine controller access to the main engine oil pressure, temperature, RPM and all other data it needs to control the engine. All the main engine data is available but we can’t yet start or stop the engine. I also purchased the optional relay pack (#33333) for the TG410. It’s easy to set this relay block up to have 1 relay for an “on” signal and have a second relay for the “start” signal. I powered the engine controller separately so I’m not adding load on the engine power system. It’s worth being very careful to never put material draw on the engine systems. For the start signal I take power from the constant 24V on one side of the key switch and run through the “on” relay and then back to the other side of key circuit. If the TG410 signals “on” the engine now switches to the “on” state. I then took power from the start switch that is only there when the engine is “on” and ran that through the “start” relay and then back to the other terminal on the start switch. At this point the controller is almost in full authority except the transmission lockout will still prevent starting. For safety reasons, the engine shift and throttle control system will alarm and prevent the engine from starting until the operator takes control at one of the helm stations. To allow automated operation, I enabled a third relay on the TG410 and configured the controller to activate this relay when it turns the engine on. Fortunately, the Dynagen comes with four relays and we’re only using 2 so far, so finding another isn’t a problem. This third relay drives two circuits: 1) transmission shift and throttle operator control system power and 2) engine start lockout circuit. In the default position, all works as before but when the TG410 takes control, the first relay disconnects the transmission shift and engine throttle control power and the second close the start interlock circuit. Summarizing the work done to this point: 1) connect the J1939 connector between the engine and TG-410, 2) configure a TG-410 relay to send the engine “on” signal to the key switch and run the wires, 3) configure a second TG-410 relay to send the engine “start” signal and run the wires, and 4) configure a third TG-410 relay also to be enabled when the engine is “on” and have this signal disable the transmission shift and engine throttle operator control and enable the start system interlock. The TG-410 relays are easy to configure through a simple menu system with no programming required. At this point the TG-410 is fully operational. It can be put into “auto-start” or “off” mode and, if you press “start” on the TG-410 front panel the engine will be started and if you press off, it will be shut down. If the engine fails to start, it’ll try again but it will try no more than 3 times. If the engine has low oil pressure or high coolant temperature, it’ll be automatically shut down. It’ll do all this more reliably than any human operator. All that is missing is auto-start and that last stage is surprisingly easy. The TG-410 is actually just a programmable logic controller with digital inputs, digital outputs and relays to drive bigger output loads, with great firmware and an easy-to-use user interface. Dynagen really does an excellent job in making the system easy to install and configure, and ensuring it can be set up to take care of the engine and not leave the starter engaged when the engine is running nor keep the engine running if there is a temperature or oil pressure fault. The final component we need is a start signal digital input. Because just about all TG-410 installs will use this, a terminal is already defined and by default configured for this purpose. When 24V is applied to this pin (this can also be configured for ground triggering), the TG-410 will start the engine and when 24V is removed, it will shut the engine down properly. The configuration I have described will send a J1939 throttle signal to the engine and run it when under load at 1800 RPM. In fact, it’ll run the engine at any requested speed. However, on Dirona our engine has the common configuration of expecting a 0-to-5 volt “throttle” signal from the transmission shift and engine throttle control system. In this configuration it will ignore the call for RPM from the TG-410 and remains at idle. This isn’t ideal in that charging is only 5.7kW at this speed, rather than the normal 9kW, but it does work. On some large-alternator configurations, running alternators at idle can lead to overheat. 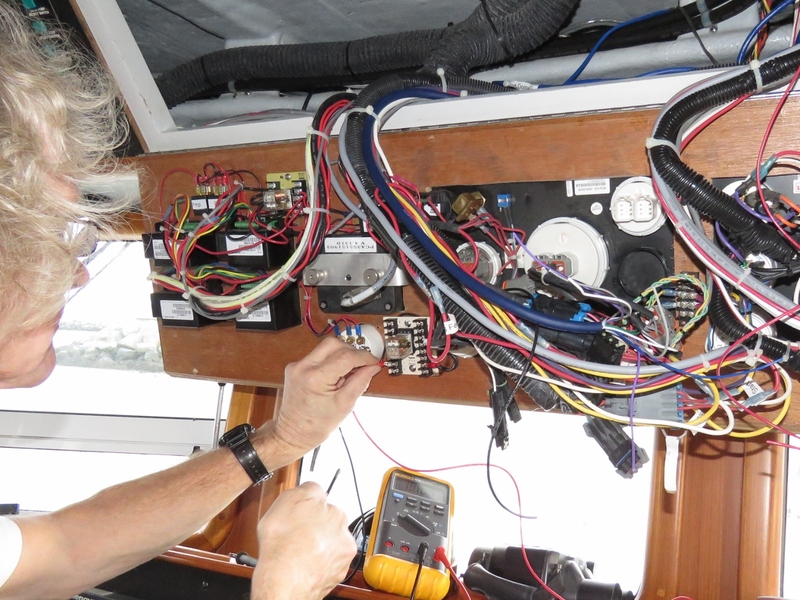 But in a good alternator/regulator installation, the regulator will back off the charging rate and not allow over-temperature since idle is actually a pretty common speed around an anchorage with discharged batteries. So this idle-only configuration will work, however, the best answer is to run the main at 1500 to 1800 RPM. From talking to Cascade Engine Center, the Deere distributor that sold our engine 8 years ago, the engine can be configured to accept J1939 throttle signals. This J1939 PGN is called Torque Speed Control 1 or TSC-1. When enabled, the main will take the 0-5V signal or, if it’s absent, use the J1939 signal instead. This is exactly what I want, but enabling this requires dealer-only access to the Deere engine control unit. I don’t have access to make the change but it’s a simple check mark for a dealer with the right software on a laptop and the right hardware to connect to the Deere ECU. For now, I only have idle but it works fine and does deliver 5.7kW without over temperature or other alternator problems. Essentially, as a backup system, it’s already 100% operational and a quick change with Deere Service Advisor by an authorized technician should have throttle control enabled. The above is a great example of why I like Cascade Engine Center so much. They sold our engine 8 years ago and yet even after more than 9,000 hours, still answer questions and make sure our Deere 6068AFM75 is performing well for us. I’m really impressed with Cascade. 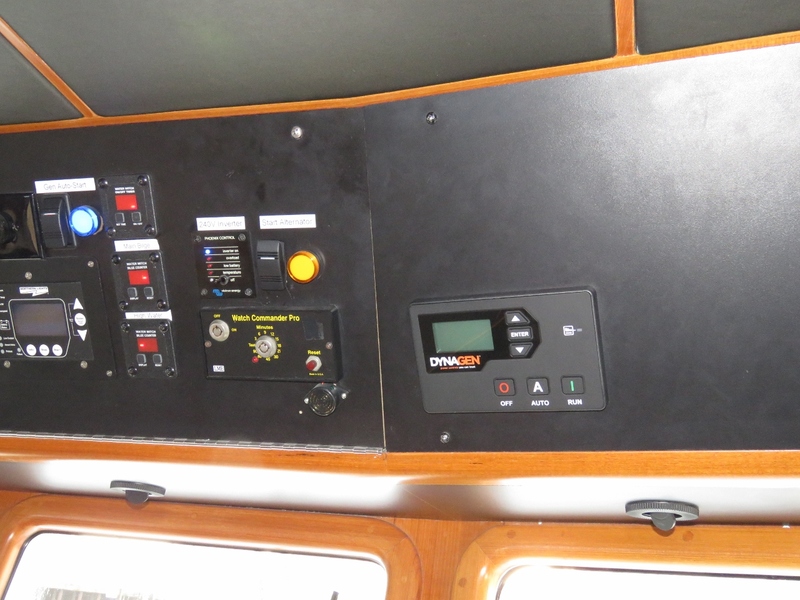 After installing any engine management changes, it is important to test the boat fire control systems, if so equipped. And all safety systems must be tested to ensure that the engine still gets shut down in the case of fire and that all safety systems remain operative after the installation of autostart. It’s also important to be able to disable the auto-start system and it should be clear that the system is in a disabled state to allow safe service while at the same time avoiding accidentally leaving them disabled. We have two signs on each of the main and the generator warning service technicians (me) to disable battery parallel and auto-start before service. We do this with a large rocker switch on the dash with a big blue light showing that auto-start is on. To ensure we don’t accidentally leave auto-start off when not servicing or when servicing is complete, we have a warning light on the dash that comes on if the main engine is off but auto-start isn’t enabled. The control system system will also send Jennifer and I email if this is forgotten or something goes wrong. Now all we need to do is have a control system send the start signal when needed. On Dirona, I have written the software to run the generator and main engine and I’ll explain what that software does. But I’ll also cover how all these same hardware components can be configured to enable auto-start without any custom programming. Our control systems have a variety of purposes on the boat, including driving the generator auto-start system. 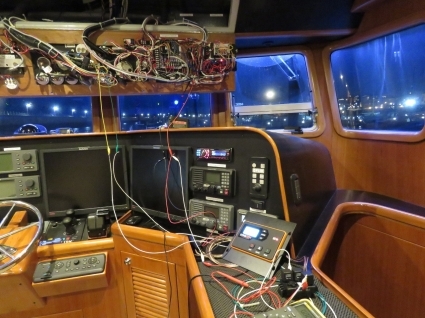 Most of the boat is networked using NMEA 2000. All data from the main engine, wing engine, and generator are on this network. In addition all power data including shore, 120V inverter, 240V inverter, and generator are there as is weather, depth, water temperature, hydraulic pressure and temperature, main transmission pressure and temperature, fresh water, black water, and gray water levels, and all four fuel tank levels. All of this data is recorded in a relational database every 5 seconds going back many years. We’re pretty big believers in NMEA2000 and use it for most applications but still there is some data not on the bus and for that we have three Raspberry Pis spread through the boat that capture more temperature data, digital input (whether devices are off or on), and they also drive digital output (turning devices off or on at the request of the control system). The control system gathers all the data from the Raspberry Pis and stores it in the database at the same frequency. This data is displayed on our Maretron N2kview display, is used to drive indicator lights, alarms, and send email. It’s all remotely accessible so all the data is available to us anywhere in the world and we can turn devices off and on remotely. Remote access is over our KVH V7hts static IP. It’s nice to turn the heat on before we arrive back to the boat on cold days for example. The control system uses this data from the rest of the boat to drive alerts and alarms, to make power load-shedding decisions (making the boat feel like it has unbounded power sources), and generator auto-start. It’s this latter functionality that is interesting here. The auto-start control functionality monitors battery state of charge and when it gets down to 55% signals the Wavenet to start the generator. 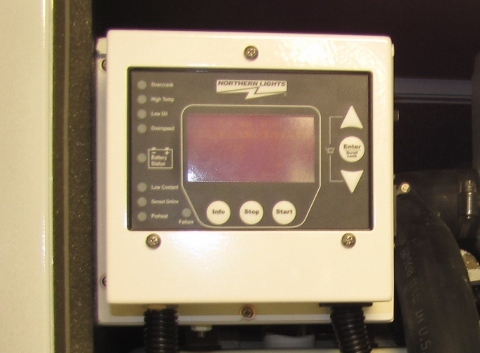 The auto-start code then monitors the generator temperature and when it rises up to 150F, it switches on the load. 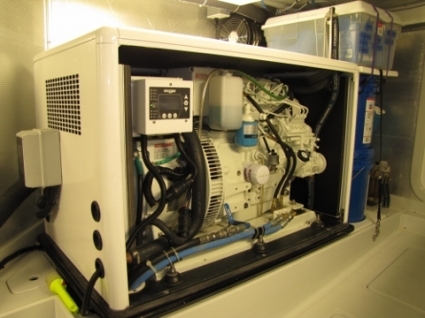 The generator then charges until the battery is up over 80% charge at which point the control system turns off the load and lets the generator cool down without load for 1 minute. Then the auto-start system shuts down the generator. It’s been doing this for years and it works well, but three things worried me: 1) what happens if the generator doesn’t start, 2) what happens if the generator stops running during a charge run, and 3) what happens if a gen breaker opens or is accidentally left open? Certainly other fault modes are possible and they range from inability to sense house voltage or current, the control system computer rebooting, locking up, or the control software restarting. Most of these fault modes are correctable without needing a second generator. For example, one of the Raspberry Pi’s monitor the control system computer and, if the control system software stops working, fails, locks up, or even the main computer locks up, the Pi is capable of depowering the computer and then powering it back up to recover. Many of these events have happened over the years and the system just sends email reporting the problem but continues to operate. The problems that remain are those big three potential problems above, gen didn’t start, fails, or doesn’t charge. For these, we really need a second generator and it’s for these rare problems that we have enabled auto-start on the main engine. When starting the generator, the control system will crank the gen for no more than 10 seconds, waits 30 seconds between start attempts, and as soon as the engine begins to start, it disengages the starter. It will try to start the generator three times before determining it’s not going to start. Why keep trying and damaging the starter or filling the water lift muffler to the point of flooding the engine? The control system knows if the generator fails start. Similarly, if there is a fault that stops it during operation, the control system knows it has failed and will try to restart it. If that doesn’t work, it knows there has been a non-recoverable problem and the generator can’t currently be used. Another fault mode is the generator runs great but the breaker opens or the generator section breaks down and stops producing power. Again, the control system knows about the problem and it will set alarms, send email, but without human interaction and without a backup generator, there was nothing that could be done and the control systems would have to just watch the batteries discharge without any ability to do anything. 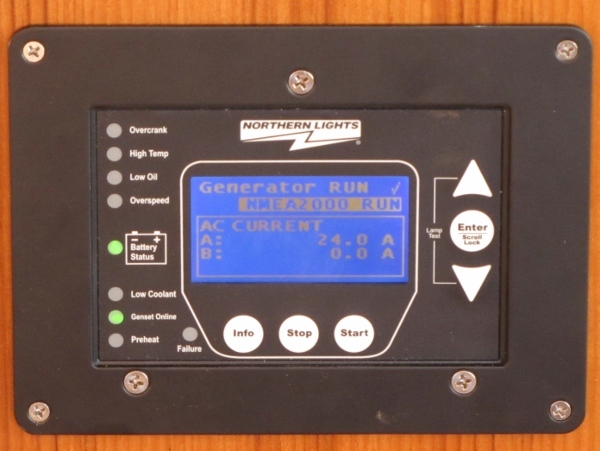 Now, with auto-start on the main engine, the control system can take action on generator failure. If the generator can’t start for whatever reason, it will set warnings, send email and switch to backup generator mode. 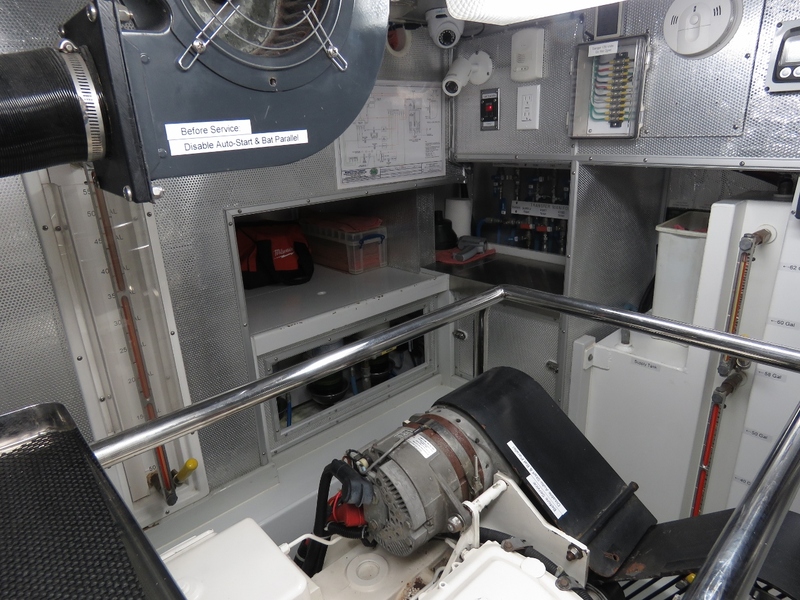 All the same systems and controls used with the generator are in place and all the procedures work the same when the main engine is instead used to charge. To start the main engine, the control system sends a 24V control system to the TG410 main engine controller. That signal causes the TG410 to go through its start cycle and it’ll run until the control system determines the batteries are charged, at which point, the 24V start signal is shut off and the TG410 does an orderly shutdown on the main engine. The system will continue to use the main engine for power generation until the generator is service and the system is switched back to primary power generation mode. If the main engine fails, it’ll switch back to the generator. If neither will start, it will stop trying after 3 consecutive failed attempts on each. We effectively have two generators with auto-start without the space required by a second generator and with less than $750 in parts (see itemized list). The only problem with this approach is the control system is fairly complex and would be difficult to replicate without software skills. However, all this functionality can be replicated in commercial equipment without additional software. Maretron N2kview is perhaps the easiest to use example of a system where you can program it to send a start signal to the generator using a DCR100 when state of charge gets below 55% and to clear this signal when charged. Most inverters have similar functionality, although sometimes with less flexibility. There are many ways to enable this functionality and most are not complex to configure. Sticking with Maretron N2kview as the easiest example, we can do exactly the same thing, where the Maretron N2kview will send a start signal to the TG410 which controls the main engine if the state of charge gets below 50%. If the generator is working, the main will never get a start signal. If the generator fails, then N2kView will start the main at a slightly lower state of charge level. In this simple operating mode, under some circumstances the generator may still be running but not charging when the main gets started but both will get shut down when fully charged. With a small amount of additional effort in N2kView, the generator start decision can be made dependent on the main not running so, if the main is started by the automation, it will shut down the generator that is possibly running but definitely not producing power. Without my control system, the start and stop decisions won’t be as precise since most state of charge systems isn’t that precise. But, it’ll still work fine. We ran this way for 2 years before implementing the more complex but somewhat more precise control system. However the system without custom programming will work perfectly fine and is far simpler to install. Given that we haven’t had the problem that I’m protecting against here in 5,248 generator hours, 9,545 main engine hours, and nearly 8 years it’s easy to argue that this simply isn’t going to happen. I protect against it because I can do it for less than $750 dollars when the batteries are worth closer to $6,000 dollars and because I know that rare events happen far more frequently than we realize. 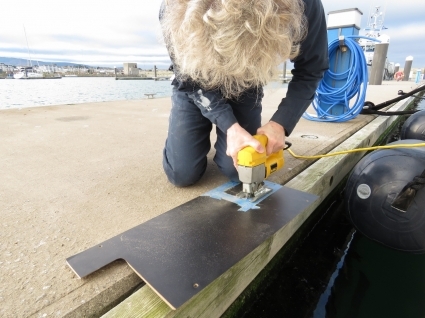 Most boat owners have, at some time or another, had a generator fault. Having a full second generator is a nice solution but, when space or cost don’t allow, $750 and some work will enable a backup solution that will protect the boat. All the above worked well, but the Dynagen TG410 throttle signal was not recognized by our Deere 6068AFM75 main engine. It’s not really a challenge to change this but you do need a Deere technician with Service Advisor to make the change. We had that small engine control unit configuration change made and it worked great. The engine is now fully under control system authority if the generator fails. But, as with all jobs, there is always at least one surprise or additional complexity. In this case, the Deere signals alarm when the analog throttle control signal is not available. The TG410 throttle signal, if present, dominates so the TG410 has full control when the main is operating as a generator but, of course, it still needs to be a main engine so needs an analog throttle control signal for the normal case. When operating as a generator, the helm control is not active and so the analog control signal is not available and the Deere alarms. Everything works perfectly in main engine mode and in generator mode but the alarm in generator mode is annoying even if it will rarely happen. Here James is figuring out the ZF ClearCommand 9000 so the control system can turn it on, “take control” at the PH helm, and avoid the extraneous “missing analog throttle signal” alarm. We’ve tested simulated generator failure. If it’s not charging, the control system shuts it down properly, raises RPM, warms up the engine, and applies the load. When the batteries are charged, it’s shut back down. Clark Haley here from N4708 “Roam”. I’m looking to convert my NL generator to an auto-start. I have a Trace Inverter that has Generator Run capability (with some modification to the NL Generator wiring). I’ve been talking with a mechanic here in South Florida that says he can wire the generator so that it will know how to handle some of the things that the Trace doesn’t handle, like excess cranking, but I think Dynastar TG-410 actually is more intelligent and would be easier (and possibly cheaper) to set up. The same mechanic called and talked to a NL engineer who told him that they can actually supply the TG-410 pre-programmed for my generator. 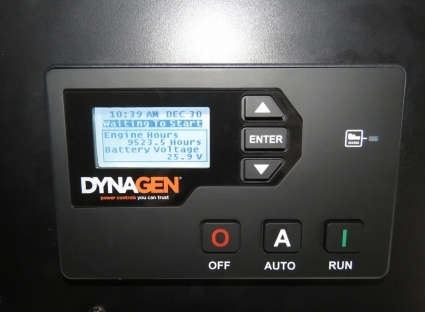 All of that is a long way around asking, does your inverter have a generator run mode and did you consider using it vs. the Dynastar unit you installed? I’ve never seen an inverter with engine start logic. It will send the start signal but you still need the Wavenet to to the engine control (start, stop, and safety shut down) and you need some form of start signal (most inverters can do this). Thanks for the feedback. My trace inverter appears to have some advanced levels of capability, but I do think it doesn’t offer enough to be used by itself. Hey James – in all of this, where was your four-legged employer? You’ve previously said that, when you open a panel or such like, Spitfire has to go dive in and take a shufti at whatever you’re working on. I get the impression that he also likes his photo being taken. Did you have to keep hauling him back and away from the electrics, or he just couldn’t be stuffed moving from COMFORTABLE_SPOT_42 ? For certain, Spitfire will have grabbed a detailed look at some point early on in that job. I actually hate him in area of the Raspberry Pi since there are so many discrete wires in that area and all it takes is one clumsy paw placement to cause trouble. Another super interesting read James! Does the auto-start or the engine controller also close the ‘parallel alternators to house bank’ switch/relay that you have set up? I remember reading when you originally set up the 2nd alternator on the main engine that you had to manually close that switch when you wished to redirect the output of both alternators to the house bank? Or, does that circuit default to the ‘parallel’ mode and in fact require manual disconnection if you don’t want it? I never see any mention of any solar generation on Dirona? I’m assuming you’ve come to the understanding that there just isn’t the real estate available for enough PV panel to do any meaningful work on that size boat? Hope all is well, and happy new year to you! The main engine has a 4.5kW alternator directly on the house batteries and another identical alternator on the start bank. When the main engine is running and the start back alternator is charging, we close the parallel circuit to allow both alternators to be available to the house. It all happens automatically. Our daily power consumption is very high so it would take a big solar array to make a dent in our consumption rate. The only location where we could accept the aesthetics is to build a fly bridge hard top out of a solar array. We prefer to have that area open and there wouldn’t be enough panels installed there to solve the problem so we ended up electing not to do the engineering to complete that project. Not sure if this is possible and fully understand if it can’t be done but was wondering if you have a schematic of your Rasp Pi circuits you would be willing to share? E-mailing it would be fine. I most interested in the circuitry used to obtain/output various signals – 110VAC, 240VAC, 12VDC, current on various power legs, etc. I saw you used Matron but believe I also saw in an article that you directly interfaced some circuits as well. All the best for a safe 2018! Hi Tim. I use the Raspberry Pis for digital input (off/on), digital output (drive relays), and temperature input using the DHT-22. Pi’s don’t have native analog input so I’ve played with an Arduino where the Arduino handles the analog work and the pi gets 0 to 1024 values off the Arduino. I’ve not currently got that work in production. For 240 and 120V data, I use Maretron ACM100: https://www.maretron.com/products/acm100.php. 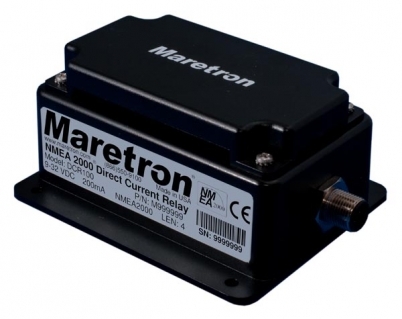 Maretron produces voltage, amperage, kilowatt hours, reactive power, actual power, power factor, etc. and puts it out as NMEA2000 PGNs. We make heavy of Maretron N2kview (https://www.maretron.com/products/N2KView.php) for our on boat monitoring. It runs on the nav computer and on all our android devices. With our static IP address, we can use N2kview anywhere in the world. It’s a pretty well thought through solution. Thanks James. Really appreciate the insights. Maretron look like really solid devices. Maretron has done a lot to make make the high performance instrumentation often seen in super yachts available at a fraction of the cost for boats of all sizes. Very interesting read, as always. As I’d see it, redundancy is the cure to my own paranoia! So, I agree 100% with the premises and the way you’ve implemented it. I only have one question : why using the main for this and not the wing? Is it because the main is keel cooled and the wing would require some additional handling? Is it because the alternator(s) on the wind do not have the required capacity? The wing would in many ways be a better choice so that is a good question. The advantage of the main is that it already has 9kW of alternator installed whereas the wing has 1/10th of that. I investigated using the wing to drive the hydraulic system and installing a hydraulic generator but it’s fairly complex and ends up both expensive and space intensive. Using the main engine as a backup generator ended up being inexpensive and easier than using the Wing as we are configured. I understand completely, it’s just a matter of the lower electrical alternator capacity on the wing engine. Improving it would have required the installation of a bigger alternator , and there you probably would have had additional mechanical constraints and mods. Totally understand now: even just a 5kW is a big beast, and the mounting, pulleys and belts etc. would have been extra complexity and cost. Exactly Jacques. For high output, it would need to be a large frame alternator so all new brackets to support a big alternator. A big alternator can’t be properly driven by a single small v-belt so we would need all new pulleys for double V-belt or, preferably, serpentine belt. In the end, a lot of fabrication. Since the Wing already has a large hydraulic pump, going to a hydraulic motor driving 1 or more alternators would also work but, again, a lot of fabrication and, in addition, more cost and space. The Main is a nice, easy to implement solution.